What if you could learn a language that spoken is by the same amount of native people as French (75.9 million) and German (78.1 million) combined? This language is spoken from the western borders of Kalinigrad to the far eastern borders of Vladivostok and has over 166 million native speakers! Moreover, if you add the 100 million non-native speakers, this beautiful language – Russian – is spoken by over 250 million people worldwide! 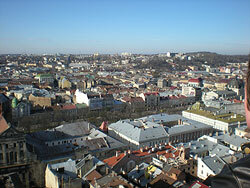 You have to see Kiev! What can I say about Kiev, except WOW! The city is simply full of beautiful churches, historic buildings, and really friendly people! I’ve been to Moscow and St Petersburg (which I loved), but Kiev is totally different, and feels really Russian, in the best of ways! It’s clean, welcoming, and very easy to get around, whether on foot, or by bus. It’s a great place in which to learn Russian, because people really are very happy to talk to you. 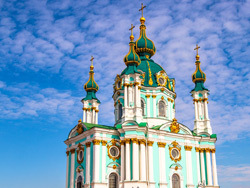 Though Kiev is a large city, with great shopping and an excellent nightlife, the pace of life is much more relaxed than in Moscow and St Petersburg, so people have time to stop and chat. If you’re a foreigner, they’re keen to help, give directions and generally look after you – even if you’ve just met them on the street! Our schools are rated (4.56/ 5) based on 3536 customer reviews!